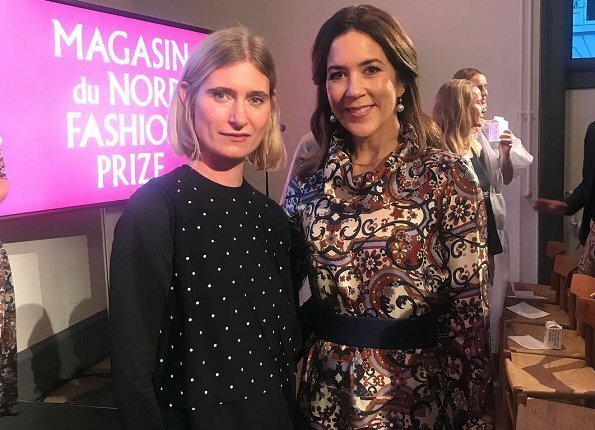 On October 27, 2017, Crown Princess Mary of Denmark presented this year's the "Magasin du Nord Fashion Prize" with a ceremony held at Charlottenborg Exhibition Hall (Kunsthal Charlottenborg) in Copenhagen. 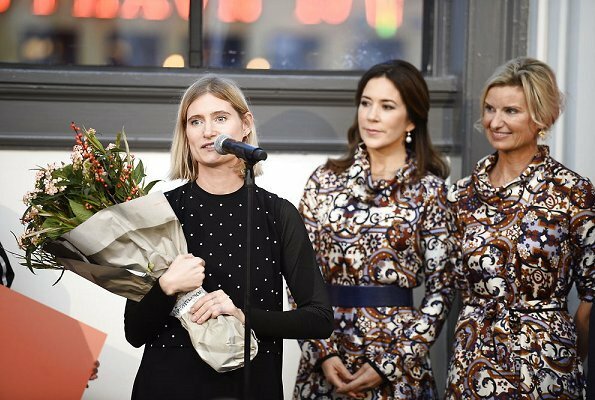 Danish fashion designer Lærke Andersen was deemed worthy of the award this year. 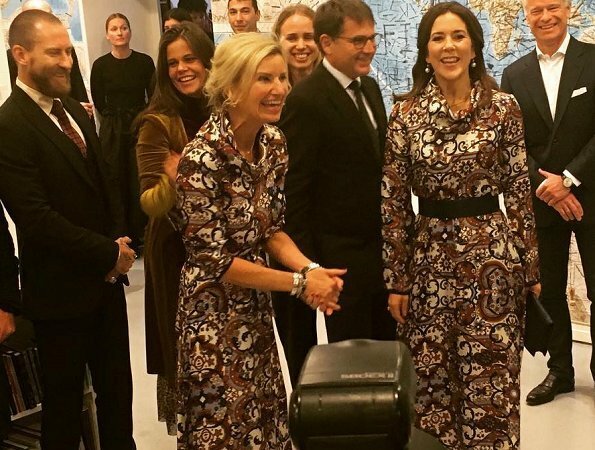 (Crown Princess Mary and Nina Wedell-Wedellsborg are wearing gowns of identical designs from Danish designer Britt Sisseck. Wedellsborg said later that this was absolutely coincidental). 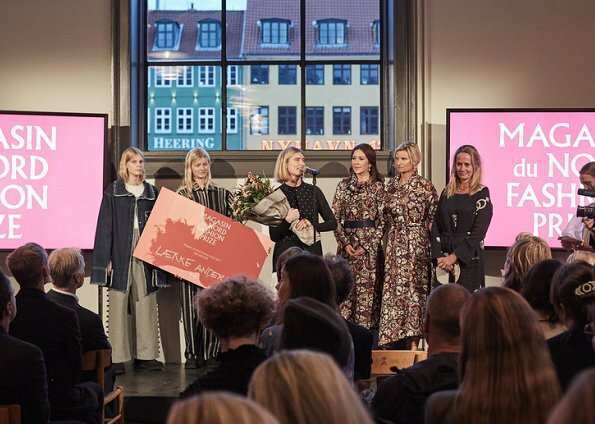 The Magasin du Nord Fashion Prize is Denmark’s biggest award for new fashion talents. 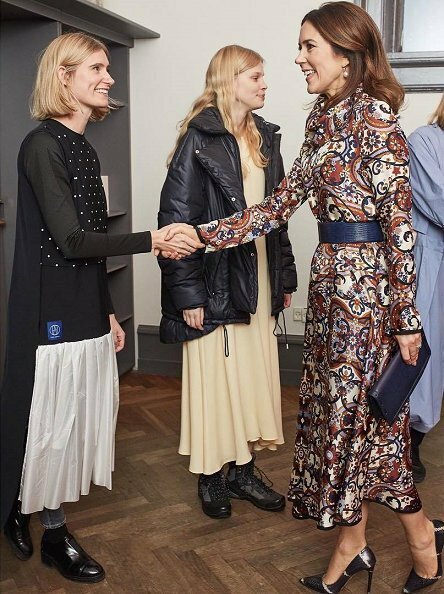 Launched in 2012 by The Magasin du Nord Foundation, the grant of 500,000 DKK (approximately €67,500) is awarded annually to a fashion designer selected by a panel of Danish and international experts. OOOPS are they wearing the same dress? Anyway Princess Mary looks magnificent - perhaps the dress is a little long, but otherwise perfect. I am not sure why the same dress was worn by the two women. Was it deliberate or a faux pas? I nevertheless like it. The caption of the picture states it was coincidental. The dress is hideous! Kudos to her for working so hard. She has been very busy recently. Another lady with the same dress?? I'm sorry, I don't like It. The print is awful. Good for a sofá or curtains! I like Mary's version with the belt. Nice dress, matching the season, that actually suits the blonde lady better, except for the shoes. It goes better with her skni and hair color. And I like it better without the black belt. For both ladies it is a tad too long. It should be midi length, middle of the shin not to the ankle. asymmetrical hem is odd, I remember how important it was in sewing class to get the hem exactly straight, so this makes me think it's just laziness to make it this way. I am happy that long sleeves and this style of neckline is back. Awful dress. And I like neither shoes, nor the blue belt that Mary added (which looks rather random). I agree with Beth that the dress looks better with the blond hair (and the pushed-up sleeves), but it doesn´t help much. The colours are ugly, the pattern very loud, and it´s just so much of it. Sloppy collar and asymmetrical hem further minuses. 70s hippie retro at its worst. It must be very unpleasant moment when you go to some event... and see that another woman wears THE SAME dress you wear. They both seem to handle this with good humor. Don't like crazy pattern of this dress. Nor its length. Neverless both ladies look lovely. This shows how you can wear one dress but when having different accessories & shoes, can create different looks. I don't like the dress. Awful fabric! I would have liked this dress much more if the hem was straight. Totally agree that the blond lady is winner here. I also like the color, that would be good to me too, I am blond with brown eyes. The dress is much nicer on the blond woman, shorter sleeves, heavier shoes, gives it a more modern look. Oh dear. It's hard to imagine that there isn't some planning done to avoid such an embarrassing situation. I don't like the dress - at first it looked like a camouflage pattern. If anything, it looks slightly better on Mary, but that isn't saying much. This is not the first time you write about this big problem, why it is such a embarrassing that someone else would wear the same clothes? If our royal ladies would wear only haute couture clothes made specially to them, taxpayers would dismiss all royal families, it would cost so much. So far they wear normal clothes there is always possibility that someone else has the same clothes. I do not feel it myself embarrassing at all, more fun. As is also seen in these pictures, Mary and the blond lady are laughing and actually the other people look rather easygoing too. What do you suggest? That they report before hand what they will wear? That shops and designers get some lists from different countries even where they put who bought what and refuse selling to any other royal or common lady? That someone makes law that common people must not wear certain cloth marks (that would make all clothe designers happy, not)? The person having similar clothe will be removed from situation?? ?